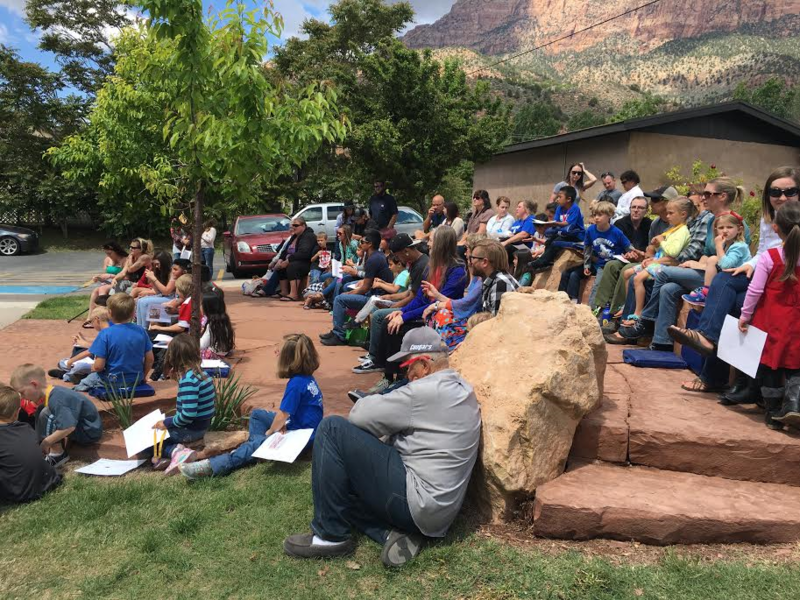 SPRINGDALE – Springdale Elementary students were presented with awards for their essays and poems about the Historic Rockville Bridge Friday afternoon during an assembly at the school. 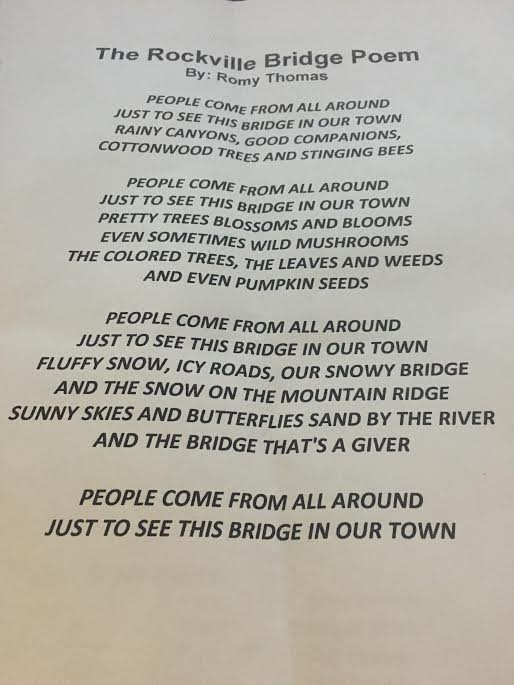 The bridge-themed writing contest was seen as a win-win for both the school, whose students engaged in learning about local history, as well as Rockville as one student’s poem was in large part responsible for the town receiving an extra $400,000 in funding for rehabilitation of the historic bridge. The 92-year-old bridge’s future has long been in jeopardy ever since its weight capacity was downgraded from the original 25 tons to 14 tons. Options for the bridge have been slim and included bridge replacement, the building of an additional bridge or bridge rehabilitation, with many of Rockville’s residents favoring the option of rehabilitation. In March, Rockville resident and member of the Rockville Bridge Fundraising Committee, Joyce Hartless, made a presentation about the bridge to the students at Springdale Elementary. 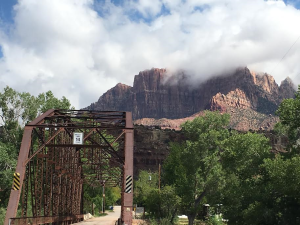 Her presentation discussed the history of the Rockville Bridge as the last Parker through-truss bridge in the state of Utah. Hartless also discussed the bridge’s significance as a connector from Rockville’s Main Street to the ghost town of Grafton as well as Gooseberry Mesa, Smithsonian Butte and state Route 59. During the presentation students were invited to participate in an essay and poetry writing contest centered around the bridge. The students were encouraged to do their own research on the bridge and come up with a compelling essay or poem that discussed the historical significance of the bridge. They were instructed to craft their submissions in a logical structure, grammatically correct to the best of their abilities. 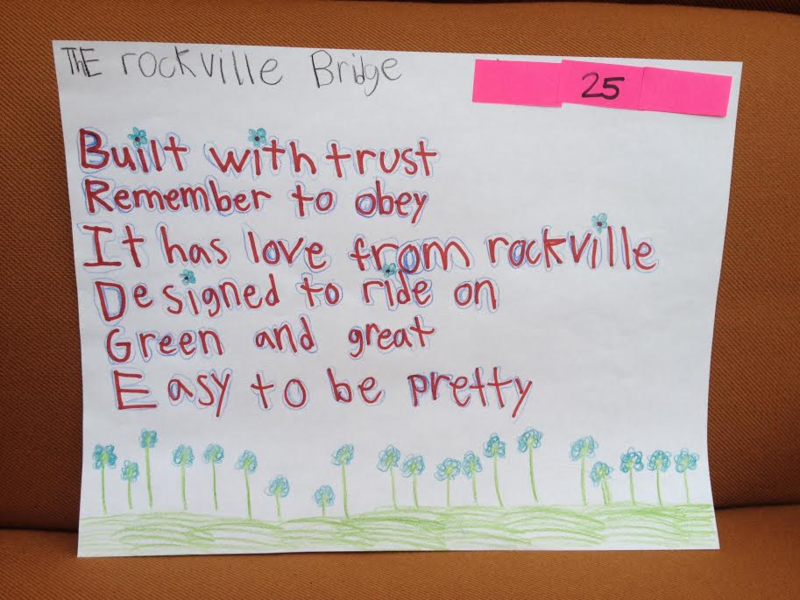 A panel of judges awarded first, second and third place to students in each grade level and those entries were posted on the Historic Rockville Bridge Facebook page. The public voted their favorites by “liking” various submissions. Each student was awarded a participation medal and the first, second and third place winners in each grade were given educational games and other prizes. 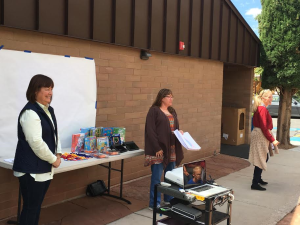 Two people’s choice winners, one from the kindergarten-to-second-grade group and one from the third-through-fifth-grade group, were presented with Kindle Fires. 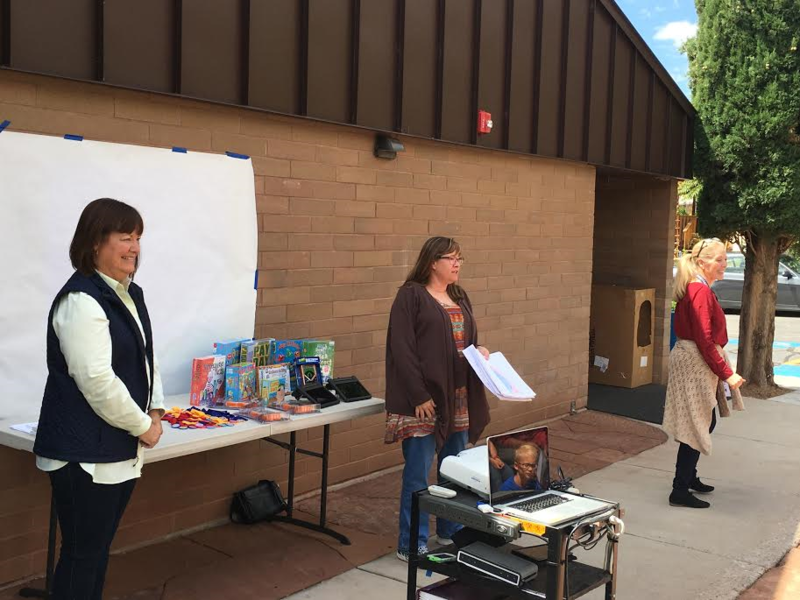 The contest and prizes were made possible by grant funds from the Eccles Family Foundation which had been specified for educational purposes, Hartless said. Hartless, along with Rockville Mayor Pam Leach, presented the prizes and praised the students for their efforts in researching and writing about the bridge which is seen as a vital landmark for many in the town. 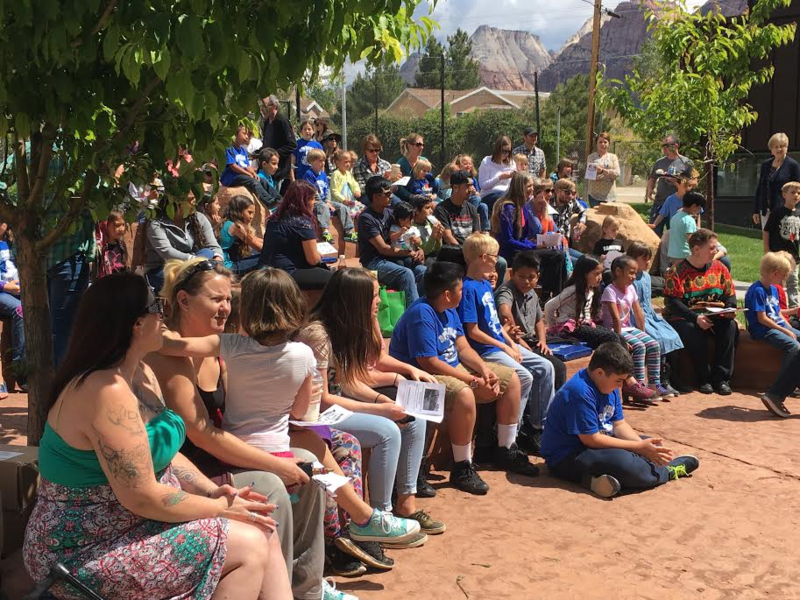 The school serves students from the towns of Springdale and Rockville as well as Virgin, Toquerville, LaVerkin and Hurricane, Springdale Elementary Principal Chris Snodgress said. Snodgress was pleased with the essay writing contest for helping to engage the students in history, writing and preservation of something that is so important to their community, she said. “We love our history,” Snodgress said. On April 21, engineers, historians and Rockville Town members met before the advisory committee to the Joint Highway Committee at meetings held at the Dixie Center St. George in St. George to request a change in the scope of grant funding for the bridge from replacement to rehabilitation to the tune of $2.1 million dollars. The advisory committee voted in favor of the reallocation and awarded the town an additional $400,000 thanks in large part to Thomas and her poem. Thomas lives on Bridge Road, Leach said, and has unique insight into life by the bridge. Although she wasn’t aware that she had won the contest at the time, Thomas was asked to read her poem in front of the advisory committee to the Joint Highway Committee. The fourth-grader showed great poise in front of the audience, Leach said, adding that Thomas’ poem, along with her reading, was directly responsible for the additional funding because it showed the committee what the bridge means to the community. On April 22, the Joint Highway Committee approved the advisory committee’s vote to award the grant funds to Rockville Town. The State offered them over $3 million to build a new double Lane safer bridge for vehicle travel and save the old one for foot and bicycle traffic, but the city council turned the offer down.